An unprecendented number of people are moving into their 50's, 60's, and beyond. You may be one of them, or you may be a helping professional who works with individuals transitioning into this stage. 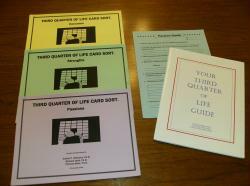 Whether you're nearing retirement, considering new options, or trying to build a more meaningful life yourself - or assisting others with these challenges - The Third Quarter of Life Card Sort Kit can help. The Card Sorts are based on solid research and a survey of hundreds of men and women in the mid-life and beyond. It was designed to help people become more aware of important issues they may face in the third quarter of life, and it helps them build on current strengths to design a future that will truly work for them. The Third Quarter of Life Card Sorts let users quickly identify the possibilities - as well as the barriers - which need to be considered to create a plan for moving ahead. They give users the tools that provide a sense of direction and healthy optimism by helping the surface current Concerns, identify Strengths, and discover Passions. You can also purchase each of the Concerns, Strengths or Passions Card Sorts individually. Based on solid research and a survey of hundreds of men and women in the mid-life and beyond, the Concerns card sort is one 3 card sorts designed to help people become more aware of important issues they may face in the third quarter of life., and it helps them build on current strengths to design a future that will truly work for them.